From losing track of our place in a script to getting beaned in the head with a slice of pepperoni pizza, we’ve experienced a myriad of things that can go awry while performing onstage. Did we handle these moments with grace? Not always, but we’ve learned enough along the way to guide YOU through 'em when they happen. 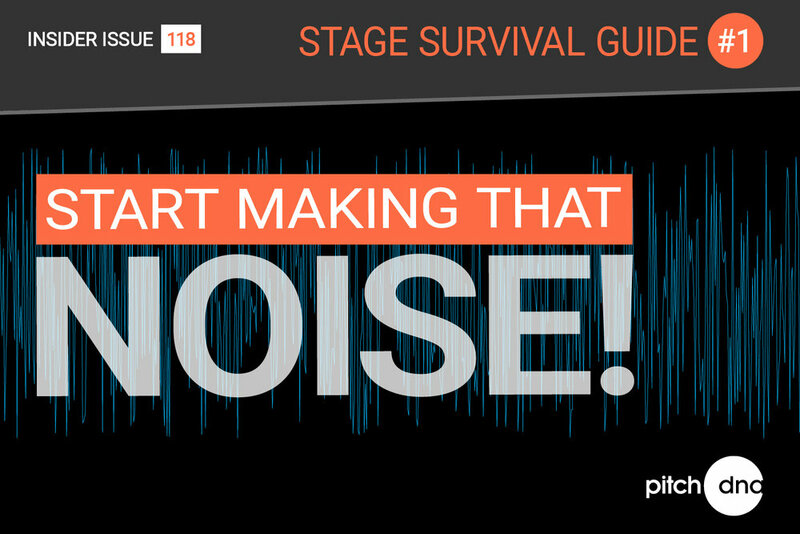 This month, in Stage Survival Guide #1, learn how auGi turned around a potential disaster. I introduced the next item up for bid – a refurbished 1970’s jukebox. After reading the complete item description, I handed bidding off to the auctioneer. When we reached $600, I heard We Are the Champions playing on the right side of the ballroom. I love that song, but why in the H was it playing NOW? Though his intentions were genuine, I think the generous donor thought it would help if the audience could hear the jukebox in action. If we were at Sotheby’s selling to a group of sedate patrons, it would’ve worked. But this room was WILD. The song not only amplified the room noise – it disrupted the auctioneer’s calls. And if the audience can’t clearly hear the auctioneer, they stop bidding. Ahhhhhhhh! Everyone in the audience stopped talking. Now, we could ALL hear the jukebox. At this point I assumed the donor, feeling satisfied that everyone knew his music machine was functional, would walk over and turn it off. I’m not sure what possessed me to take this next step, but I knew I had to regain control of the situation. So I tapped my best inner-Freddie Mercury and screeched along. I’m not saying it was good singing, but it didn't matter. What did matter was that I committed 100% to my action. And it paid dividends. Not only did it refocus the crowd – the audience joined me during the triumphant chorus. Let me add, the resonance of 301 people belting out one of the coolest songs ever written sent an electrical charge both through me and the gracious humans sitting in those seats. Our shared experience brought us closer together, reignited bidding, and created a powerful moment the attendees will never forget. So, what can YOU do when you’re mid-talk and there’s a significant audible distraction? Don’t get mad, because the source of the noise is either motivated by good intentions (a jukebox “demo”) or a common mistake (during the most intimate moment in your talk, someone’s ringtone blasts Ride of the Valkyries). Turn the distraction into an opportunity. You probably won't ever need to karaoke, but you WILL encounter something that demands your attention. If you make it fun, you'll keep the audience on your side. Commit to your action. Whatever device you choose to manage the challenge, make it count. If you put your all into it, the audience will love you for your courage. WHAT DID YOU ENCOUNTER DURING A TALK OR PITCH THAT KNOCKED YOU OFF BALANCE? When presenting, assume your audience doesn’t know anything about you or what you’re going to talk about. This moment in time is what we call “Information Zero.” A simple way to gain understanding is through this time-tested, three-part structure. If you focus your energy exclusively on positives when presenting a new idea, you’ll lose credibility. If you want to win the pitch, you need to also address The Cons.